Look at what the left has done to America.This evokes the methods of the Third Reich. 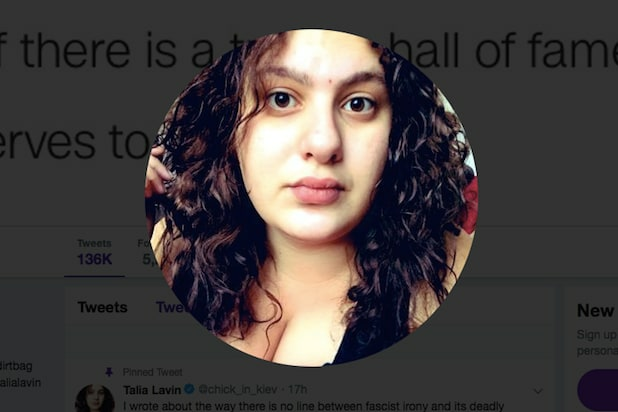 New York University has hired Talia Lavin as an adjunct journalism professor less than a year after the former New Yorker fact checker resigned after falsely accusing an Immigration and Customs Enforcement agent of having a Nazi tattoo. March 20, 2019 by Sarah D.
NYU has hired Talia Lavin to teach an undergraduate course called "Reporting on the Far Right"
Why wouldn’t they mention something like that? "I don't know why someone who had to quit their journalism job for falsely implying someone is a Nazi should be teaching at NYU. I know there are plenty of reporters out there in need of work who haven't made a mistake like that." We don’t know why someone like Talia Lavin should be teaching at NYU, either. Yet here we are. Why is that even a course? What are we doing? Maybe they can be sold for scrap somewhere. CNN gets a Cronkite award for the Parkland Town Hall and Talian Lavin and Lauren Duca are teaching journalism at NYU. Is there any wonder why the media is a dumpster fire?